The Hunger Site, now new and improved. A click a day helps feed the hungry. Free Rice will test your vocabulary or your art history and feed the hungry! ABC's of Anarchy, written and illustrated by Brian Heagney. Not to be missed. 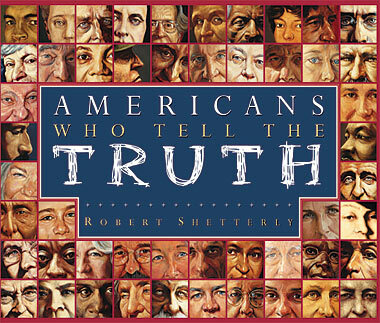 Americans Who Tell the Truth, a exhibition of a collection of portraits and quotes; paintings by Robert Shetterly. Shetterly's project, to paint the portraits of Americans who speak truth to power, includes both contemporary and historic individuals. The first 50 portraits have been published in book form by Dutton. Shetterly says: "One lesson that can be learned from all of these Americans is that the greatness of our country frequently depends not on the letter of the law, but the insistence of a single person that we adhere to the spirit of the law." Art & Social Issues, website for the Columbus Museum of Art, Columbus Ohio. "In May 2005 the Columbus Museum of Art acquired the Philip J. and Suzanne Schiller Collection of American Social Commentary Art, 1930-1970. . . .These visual images provide a vivid, authentic picture of American history and culture. They also serve as a springboard for confronting issues that continue to face America today, especially as they relate to Economics, War and Race and Ethnicity. This Website is intended to provide opportunities and resources for visitors to explore these critical issues through works of art from the collections of the Columbus Museum of Art." The Art of Democracy is a national coalition of art exhibitions on the dire state of American politics scheduled for the Fall of 2008. "Art to the People" provides images, biographic information and interpretation of symbols used in the work of Walter Crane, Théophile A. Steinlen, Albert Hahn, Frans Masereel and Gerd Arntz. In addition to its useful content on these late 19th-early 20th Century artists, the site is a marvel of elegant design -- the site is part of The International Institute of Social History. Art for @ Change, an image library that includes John Heartfield, posters from the Spanish Civil War and Paris student/worker uprising, and more. Barefoot Artists, founded in 2003 by Lily Yeh, aims to train and empower local residents, organize communities, and take action for a more compassionate, just and sustainable (better) future. Their projects include communities both in the United States and overseas. 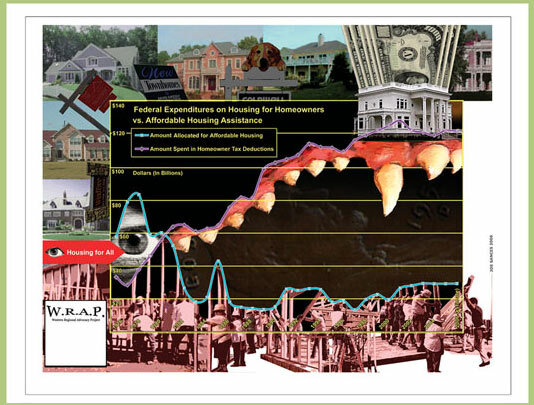 Stephen Barnwell designs moneyart with a historical/political eye. The work of The Beehive Design Collective has three major facets: the Hive is appreciated internationally for its educational graphics campaigns, at a regional level for its stone mosaic murals and apprentice program, and locally for its dedication to the revitalization of the old Machias Valley Grange Hall, a landmark building in the small, rural town of Machias, Maine. The Hive has been going and growing since 2000. Bread and Roses Cultural Project is the not-for-profit cultural arm of Local 1199, the National Health and Human Services Employees Union. Its 220,000 predominantly Latina and African American women members are employed in all job categories in health care institutions throughout the metropolitan New York City area, New Jersey and Florida. Buttons of the Cause, a site devoted to political/social buttons (1960-2003) on a wide variety of issues by Al Feldstein, who has collected over 9000 such examples of graphic history. Over 370 of them have been reproduced in a poster, which is available for sale on-line from the site. The Center for the Study of Political Graphics collects, preserves, and exhibits posters relating to historical and contemporary movements for social change. 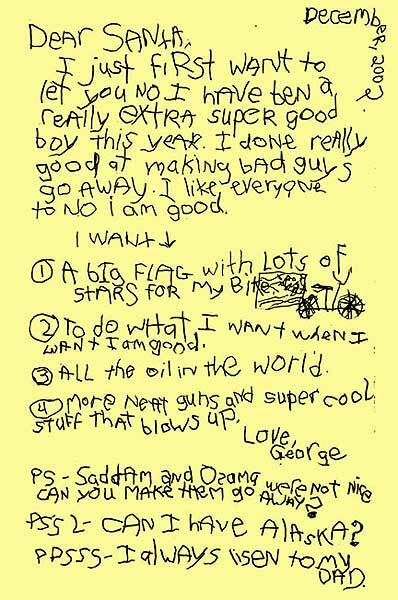 Through its varied programs, CSPG is reclaiming the power of art to inspire people to action. In German, with links to the Spencer Museum of Art. Docs Populii -- documents for the public, a wealth of visuals and history. From Draloo Arts, Inc., Mike Woolard paints with toothpicks on glass, using Testor's model car enamel. These images are reproduced on postcards offered to independent bookstores for sale or free distribution. His mission: to "... provide quality products to aid the independent bookstores of America in their struggle for continued existence. We will never sell out to the Corporate Giants who are sucking the life out of our Country and homogenizing our souls." You can begin Mike's gallery tour here. Drawger is a central spot on the web where illustrators are writing about whatever it is they're writing about at the time, and showing stuff as well. There is a lot to look at here, and a good place to start is with the shows [Women's Work is my favorite] and galleries. Editions Gerald and Maas, an atelier at the intersection of graphics, poetry and activist politics. Mike Flugennock's Mikey'zine a radical poster artist's graphic blog with an archive going back to the early 1980's as well as up to the minute news and views. Fiori Art, one artist's mission to "combat the media and therefore the government and corporations' influence on the populace." The Guerrilla Girls , established in 1985 and still going strong in the 21st century, are a group of women artists, writers, performers and film makers who fight discrimination..."Dubbing ourselves the conscience of culture, we declare ourselves feminist counterparts to the mostly male tradition of anonymous do-gooders like Robin Hood, Batman, and the Lone Ranger. We wear gorilla masks to focus on the issues rather than our personalities. We use humor to convey information, provoke discussion, and show that feminists can be funny. In 17 years we have produced over 80 posters, printed projects, and actions that expose sexism and racism in politics, the art world and the culture at large. Our work has been passed around the world by kindred spirits who we are proud to have as supporters. The mystery surrounding our identities has attracted attention. We could be anyone; we are everywhere." Haute Vitrine, a blog by thoughtful, curious Canadian photographer Leslie Hossack. On the blog, it is one very very long scroll, so be prepared, but it is well worth it. Illoz... "an idea that started in a chat area of the Drawger web site." Always graphic, often political. For example, you can search for t r u m p or by artist, subject, etc. The Siege and Commune of Paris (1870-71): Caricatures from the Charles Deering McCormick Library of Special Collections, Northwestern University. The site includes links to the library's collection of digitized photographs taken in Paris during this time, as well as other related images. JEMA: The John Erickson Museum of Art is a unique museum, changing both exhibitions and locations, as well as maintaining its on-line presence -- "On July 25th 2003 at 2:40pm JEMA celebrated its Grand Opening in the lobby of the Seattle Art Museum. Openings at JEMA are scaled down in duration appropriate to size. The opening lasted two minutes." Check it out and prepare to be fascinated and delighted. Justice Design, "graphic design for the progressive community" -- a commercial graphic studio by Jason Justice, who says, "The aim of this work is to provide innovative graphic design for socially good & worthwhile causes, and contribute positively to a wide range of political, social and cultural endeavors." Photo essays by Herman Krieger. His camera captures, with compassion and wit, the contradictions and the beauty of the commonplace. Latin American Graphic Arts, an extensive look (in Spanish and English) at rarely seen, primarily 20th Century prints from Latin and South America, including detailed works by Leopoldo Méndez, and a reading primer published by LEAR. Don't miss "making faces at the enemy". This hand lettered sign, not far from the nation's capital in Prince William County (PWC) Virginia, in the town of Manassas (site of the Civil War battles of Bull Run) is one man's response to the recent escalation in anti-immigrant sentiments. It connects the dark side of capitalism (maintaining a pool of cheap labor through apartheid and racism) with the genocide visited upon indigenous populations in the post-Conquest era. For the death of world imperialism, poster [right] by Dmitry Moor (Orlov), 1920. This poster and others were formerly found at a Museum of Russian posters site. This updated link has many Russian posters or 'plakaty' c.1920s. The website name, Marks & Stencils (think British retailing giant Marks & Spencer) of the stencil/graffiti artist Banksy, hints at his equally incisive irreverence for backward social and political policies. Comic artist Aaron McGruder's daily strip,The Boondocks is now also a TV show. See a selection of McGruder's work in response to the September 11 aftermath. "The strip appeared daily until it was pulled from many papers this week [December 3, 2001], allegedly for 'patriotic' reasons." -- from a Z Net commentary by Frances M. Beal, a political columnist for the San Francisco Bayview newspaper. Melton Prior Institute for reportage drawing (older version of site with many 'pictorials'). text in English, French and German. The Melton Prior Institute provides the basis for an internationally oriented research on the history of reportage drawing. Mural Conservancy of Los Angeles -- public, populist art, often with social or historic content -- "Until the 1960s, public murals in Los Angeles were few and far between, isolated instances of commemoration or appreciation. During the sixties and seventies, young artists began to look at the early-century Mexican mural movement. Such notables as David Siqueiros, Diego Rivera and Jose Orozco helped inspire a new generation of Angeleno muralists such as Kent Twitchell, Terry Schoonhoven, Judith Baca, Frank Romero, Alonzo Davis, East Los Streetscapers and many others. Today upwards of a thousand murals have been produced in L.A., with new ones appearing on a regular basis. It has been widely acknowledged that we are one of the world's mural capitals." No Caption Needed, iconic photographs, a book and a blog, each dedicated to discussion of the role that photojournalism and other visual practices play in a vital democratic society. No caption needed, but many are provided. . . .
from The Nation Magazine: "At this dangerous moment in history, our actions will determine our very survival. As artists, we use our pens, our pencils, our brushes, and our ideas to cast a light on darkness and combat the forces that are driving us towards a precipice. Curated by Andrea Arroyo, Steve Brodner, and Peter Kuper, OppArt features artistic dispatches from the front lines of resistance—check back each day as a diverse set of artists take aim and draw." 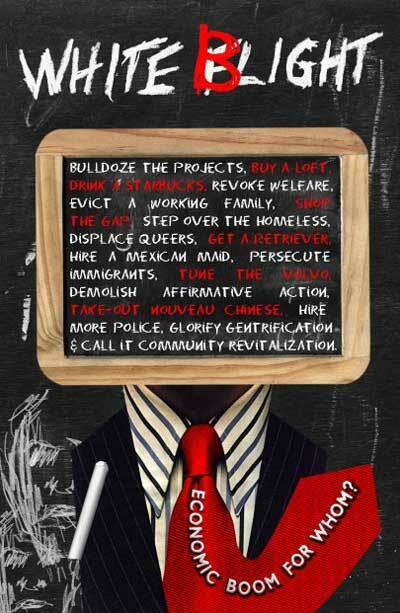 Provisions Library, a resource center for activism and arts. Changing exhibitions and programs. 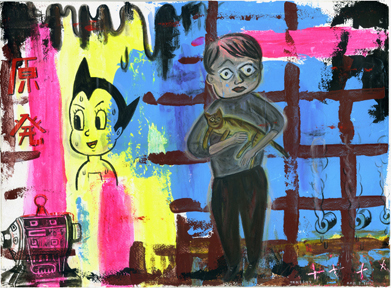 Shake Girl, a production of The Stanford Graphic Novel Project. The book is being used " . . .to create awareness about the issues of violence against women, and more specifically, the phenomenon of acid attacks in Cambodia. For these same reasons, we are publishing Shake Girl for free on the web. -- though we encourage readers to donate to charities that help amend the human right violations that currently occur in Cambodia." Jesse Shaw is an American Printmaker. "We as Americans and human beings, need to step back and take a good look at our society and our environment and try hard to see through it all. See through all the military propaganda, advertisments trying to tells us what we need and who we should be, and how we should look and act." His woodcuts mean what he says. 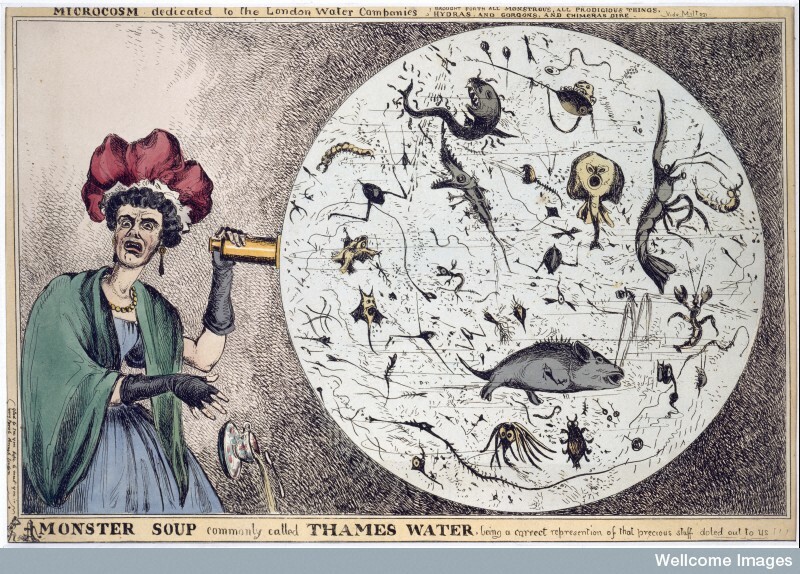 British and American cartoonists and illustrators from the Spartacus Educational. Great site, full of social, labor and civil rights history, as well as cartoons and illustrations. Stencil Revolution, a global community of stencil, street, and graffiti artists originally founded in 2002. The Strip, by cartoonist Brian McFadden. A response from Tokyo by Takeshi Tadatsu, to the on-going nuclear crisis. Sunaura Taylor is an artist, writer and activist. She is disabled due to U.S military pollution, a legacy that has affected all aspects of her work. Think Again, "artists who strike back at mainstream ideas that perpetuate injustice." and see also Protest Graphics, "a selection of original graphics that respond to the military action in Central Asia, violence against Arab and Muslim Americans, and the Bush administration's 'invisible war on terrorism.'" left: Economic Boom for Whom? These billboards appeared on the streets of Santa Cruz, California, from 1980 to 1985. The billboards were made over by a clandestine network of midnight billboard editors operating under the name of Truth In Advertising, or TIA for short. An exhibit of their historic work was first presented in 2007 at the Santa Cruz Museum of Art and History. Now for the first time the exhibit is available on the web. It is made up of 12 billboards presented in the order in which they appeared on the streets of Santa Cruz. The sequence also tells the story of Truth in Advertising, and documents publicity and commentary. W.R.A.P. stands for Western Regional Advocacy Project, a coalition of west coast social justice-based homelessness organizations. WRAP is with artists to create imagery that communicates their political struggle. Alternet.org, "an online magazine and information resource...providing quality journalism, dependable research, issue-focused public interest content and passionate advocacy..." Overall, we seek to engage our community of readers in problem solving, community action and awareness of current events in the United States and abroad. CounterPunch, "America's best political newsletter"
Center for Economic and Policy Research, "established to promote democratic debate on the most important economic and social issues that affect people's lives...to ensure that the citizenry has the information and analysis that allows it to act effectively in the public interest." Disability Issues Information for Journalists, "a communiations clearinghouse providing journalists credible information and quotable sources on national disability policy and independent living issues." Earth Policy Institute, "dedicated to building a sustainable future as well as providing a plan of how to get from here to there." Lester Brown's book, Plan B 3.0, Mobilizing to Save Civilization is available on-line in pdf format. Read it and mobilize. FAIR (Fairness & Accuracy In Reporting) "the national media watch group, has been offering well-documented criticism of media bias and censorship since 1986. We work to invigorate the First Amendment by advocating for greater diversity in the press and by scrutinizing media practices that marginalize public interest, minority and dissenting viewpoints. As an anti-censorship organization, we expose neglected news stories and defend journalists when they are muzzled. As a progressive group, FAIR believes that structural reform is ultimately needed to break up the dominant media conglomerates, establish independent public broadcasting and promote strong non-profit sources of information." Free Speech TV -- Democracy Now, interviews, streaming audio/video newscasts and much more. The Consortium for Independent Journalism, a source of information based on investigative reporting; home of American Dispatches Magazine (formerly iF Magazine). British based MediaLens "has grown out of our frustration with the unwillingness, or inability, of the mainstream media to tell the truth about the real causes and extent of many of the problems facing us, such as human rights abuses, poverty, pollution and climate change." Media alerts on a wide range of issues, including animal rights, biotechnology, corporate spin, globanization. Monthly Review: "There has never been a more important moment for MR's unique blend of scholarship and activism, critical understanding and accessibility. MR speaks to workers and labor organizers no less than to academics, and against class exploitation, no less than against racial and sexual oppression. It has never been more indispensable as a guide to current realities, their historical roots and the prospects for change. It is an essential voice for today." NOT IN OUR NAME The national project has come to an end -- see the statement and photos on the site. Although The New Standard ceased publication in 2007, you can still find its archive on-line. The New Standard "is a unique online newspaper founded on the belief that the dominant model and methods of profit-focused news journalism have failed the public interest. Managed by a collective of journalists and published by a reader-funded nonprofit organization, TNS is committed to bold, hard-hitting daily news coverage, providing a vetted forum for the voices and issues often ignored in the establishment news arena". The Nation, a weekly magazine: editorial cartoons by Edward Sorel, Tom Tomorrow, and others; regular columns by Katha Pollitt (Subject to Debate), Alexander Cockburn (Beat the Devil), Patricia Williams (Diary of a Mad Law Professor) and more. OECD (Organization for Economic Cooperation and Development) provides a Better Life Index. This Index allows you to compare well-being across countries, based on 11 topics the OECD has identified as essential, in the areas of material living conditions and quality of life. OMB Watch (ceased operations as of March 2016 and is now, March 2018, being maintained as an archive). The majority of OMB Watch work and materials has been passed on to the Project on Government Oversight (POGO) another public policy watchdog. Office of Management and Budget in its own words (i.e., the words of the latest administration). Peace in the Middle East, a group of American Jews who drafted and signed an Open Letter published in U.S. and Israeli newspapers. Signatures are still being collected; support from Jews and non-Jews is welcome. The goal is to keep adding supporting names, and publish as widely as possible, both in the U.S. and the Middle East. Public Citizen, a public policy watchdog group founded by Ralph Nader. The Progressive, a monthly magazine of progressive thought. Progressive Populist, a journal from the Heartland that believes people are more important than corporations. Will Potter, a journalist with a strong interest in animal and civil liberties. His blog analyzes cases of 'red baiting with a green twist'. Regulations.gov, your voice in Federal decision making. The government calls for public comment on suggested policies (e.g., leasing oil drilling sites on public lands to private corporations). Salon magazine, an on-line journal of contemporary culture. Tikkun Community and Magazine, from the Hebrew word tee-kün, meaning 'to mend, repair, transform' the world. Pro-Palestinian, pro-Israeli, pro-peace. UNITE! A new chapter in the history of the U.S. labor movement began in 1995 with the founding of UNITE (Union of Needletrades, Industrial and Textile Employees). The new union was formed by the merger of two of the nation's oldest unions, the International Ladies' Garment Workers' Union (ILGWU) and the Amalgamated Clothing and Textile Workers Union (ACTWU). The site provides resources both for current actions and information and a history of the union's struggles, including a link to the infamous 1911 Triangle Shirtwaist Factory Fire. The Ultimate Field Guide to the U.S. Economy is the latest version of "the best and . . . least solemn guide to the dismal science you are likely soon to encounter" (John Kenneth Galbraith). Available in book form with revisions and updates on the web. World Watch Institute, dedicated to fostering the evolution of an environmentally sustainable society--one in which human needs are met in ways that do not threaten the health of the natural environment or the prospects of future generations. While we do not advocate any violent action against private property or citizens, we do advocate using the Power of The Purse and non-violent action to bring back responsibility to the corporate media." YThe Yes Men, practitioners of Identity Correction, where honest people impersonate big-time criminals in order to publicly humiliate them. Targets are leaders and big corporations who put profits ahead of everything else (as opposed to Identity Theft, where small-time criminals impersonate honest people in order to steal their money). Check out their DVD. Z Net, a community of people concerned about social change, maintained by Z Magazine, "an independent political magazine of critical thinking on political, cultural, social, and economic life in the United States. It sees the racial, sexual, political, and class dimensions of personal life as fundamental to understanding and improving contemporary circumstances and it aims to assist activist efforts to attain a better future."